Back when I was still living at my parents’ house, my sister decided she liked hummus. So, of course, she had my parents go to Trader Joe’s and buy her some. At the time I tried some, and I hated it. I thought that was it for me and hummus. A few months ago, Son and I went to Costco. Now, everyone knows that the best part about Costco (aside from the great prices and $1.50 hot dog and drink combo) are the samples! One of the samples they were offering that day was hummus. On a whim, I tried some, and it was really good! We ended up not buying any that day, which was disappointing. And then, a couple of weeks ago, I had a stroke of genius. Okay fine, so it wasn’t my stroke of genius, but I’ve looked everywhere and can’t for the life of me remember who told me about this. Anyways, the stroke of genius was… hummus in sushi! 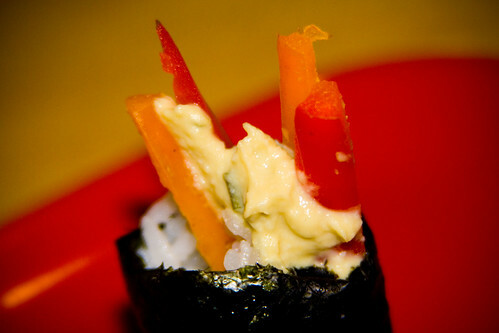 More specifically, red and orange bell peppers and hummus in sushi. Which is amazing. Er, amazingly delicious! If you like hummus, and bell peppers, I definitely recommend making this! It’s especially great for vegetarians (and I believe it’s also vegan, but that might depend on the type of hummus you use? I’m not entirely sure.) plus it’s not one of those bland, I’m-trying-to-make-something-for-vegetarians-but-failing-miserably dishes. Remove stem, ribs, and seeds from the bell peppers. 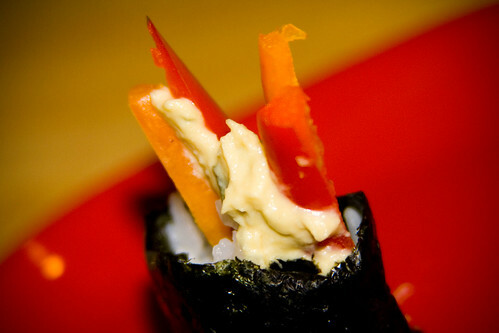 Roll the sushi, using about a tablespoon of hummus and a few strips of bell pepper as your fillings. Allison, store bought hummus is whack! Make your own, and you’ll find out just how amazing it can be. Saw your post about hummus and sushi (two of my favorite foods) and I had to give this a try. In a word: YUM!! Making hummus is super-easy too. I used the recipe from Cook’s Illustrated magazine (which has a couple of variations, including roasted garlic and roasted red pepper, which I plan to try) The key is to make certain the hummus is silky-smooth and not grainy. And my three-year old helped me make the maki and eagerly gobbled a ton up! emma – We just got some of the Sabra garlic hummus from Costco. It’s pretty good, but I think I prefer the hummus that we get from our farmer’s market. However, when we can’t get to the farmer’s market, it’s the next best thing! I’ve found that bagel chips are also really good with hummus! Katrina – Awesome! I really do need to start making my own hummus… everyone says it is so easy! I’m glad to hear that both you and your three-year-old liked the sushi! I tried this out last night and thought it was great. I’m going to try another batch in a couple of days and try lightly cooking the bell peppers in some Mirin to soften them up a bit. Rolling with the peppers was a bit tough since they were rigid. Yay! I’m glad you liked it! I sliced the bell pepper into thin slices, so rolling it wasn’t a problem, but your idea is great, especially for people who would prefer a softer consistency to their sushi! cesca – That sounds delicious as well!